The present (hereinafter the "Contract") applies if you obtain a photograph, illustration, image (layer solo), other graphic work, a composition of images (layer compo) or a pack of images (layer pack) (hereinafter collectively, the "Work") licenced Alpha3 Images Inc. (hereinafter "Alpha3" or "We") from Alpha3's website layer-lab.com (hereinafter collectively the "Website") or otherwise. By downloading or obtaining Work from Alpha3, you agree to the terms of the present Contract and agree that this Contract applies to each Work. If you obtain or download the Work on behalf of a corporation or legal person, then this Contract shall apply to it. In such case, you certify that you are entitled to bind this corporation or legal person under the present Contract. OWNERSHIP OF THE WORK 1.The present Contract does not transfer any right of ownership in the Work to you. No intellectual property rights are transferred or granted to you by the present Contract, except as expressly provided in the license granted to you hereunder. a. Standard License Applies in the case where We grant you a Standard License in respect of the Work as described in the section "STANDARD LICENSE" in the license table above. Namely, we grant you a non-exclusive, worldwide, and non-transferable license which may not be sub-licenced, for you to use, reproduce, modify or display the Work for non-commercial and commercial purposes according to the terms for a "STANDARD LICENSE" indicated in the license table. b. Extended License Applies in the case where We grant you an Extended License in respect of the Work as described in the section "EXTENDED LICENSE" in the license table above. Namely, we grant you a non-exclusive, worldwide, and non-transferable license which may not be sub-licenced, for you to use, reproduce, modify or display the Work for non-commercial and commercial purposes according to the terms for a "EXTENDED LICENSE" indicated in the license table. as suffering from, or under treatment for, a mental or physical condition; or engaging in criminal or immoral activities. use the Work (in whole or in part) as a trademark, service mark, logo or other indication of origin, or as an integral part of it; falsely, explicitly or misleadingly claim that the Work was created by you or a person other than the copyright holder of such Work. 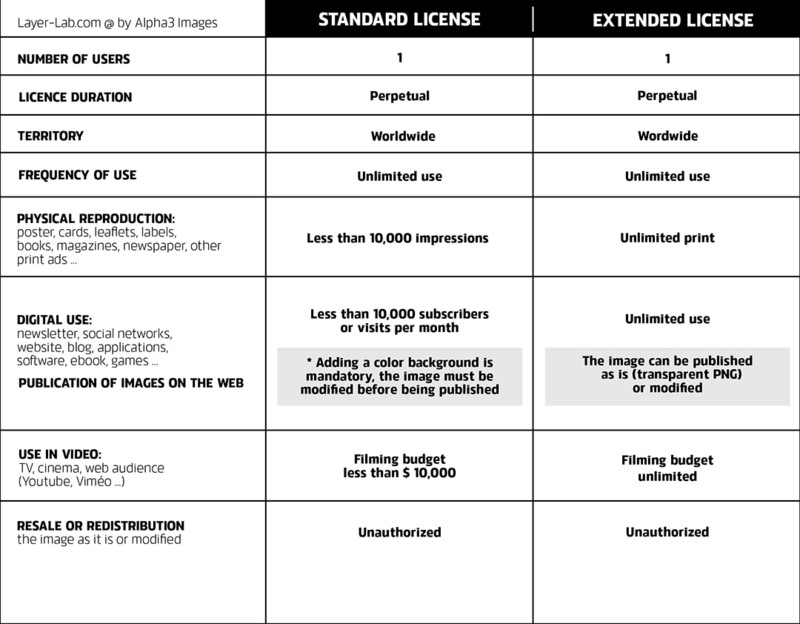 4.YOUR OBLIGATIONS Payment of License Fees in consideration of the license granted to you herein, you agree to pay the licence fee in relation to the Work as established by Alpha3. Upgrade of Licence. If your use of the Works no longer corresponds to the rights granted to you under the category of license purchased pursuant to section 2, you undertake to immediately purchase the category of license that corresponds to your current use of the Works. No refund or credit will be provided for the categories of licences already purchased. 5.INDEMNIFICATION By You You agree to indemnify Alpha3 for any loss, damage, expense, fine, or other expense incurred by Alpha3 arising out of your use of the Work in a manner contrary to this Contract or the use of the Work in a manner otherwise expressly provided in the present Contract. (c) arising out of any other claim made in connection with your use of the Work. 7.CANCELLATION Alpha3 reserves the right to cancel the present Contract in the event of any breach by you of the terms of the Contract or any use of the Work contrary to the license granted to you hereunder, through a notice to your attention from Alpha3. Upon cancellation of the present Contract you shall cease to use the Work and destroy all copies of the Work and all derivative Works and related documents (if applicable) in your possession or under your control. 8.GENERAL Applicable Laws The present Contract is governed by the laws of the Province of Quebec, without regard to the conflict of law principles which may require the application of the laws of another jurisdiction. Any claim, whether directly or indirectly relating to the present Contract or the Work, shall be brought before the courts of the judicial district of Montreal, to the exclusion of any other court or jurisdiction. Assignment You may not assign or otherwise dispose of your rights under the present Contract. ModificationTo the extent permitted by law, Alpha3 may amend the present Contract, for example, to reflect changes in the law or changes to our services. You should periodically review the present Contract. We will post notices of changes to the present Contract on our website. By continuing your use of the Work, you consent to be bound by the modified terms.